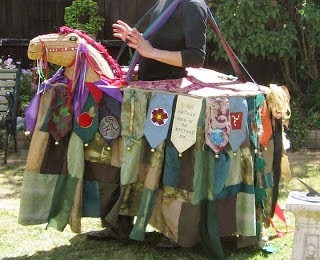 It’s not often that you find a hobby horse like Dobbin in Australia. There are hobby horses out there, but I’m yet to see one like my Dobbin. I recall greatly desiring to own a homemade hobby horse, especially after watching ‘The Wicker Man’ (1973). 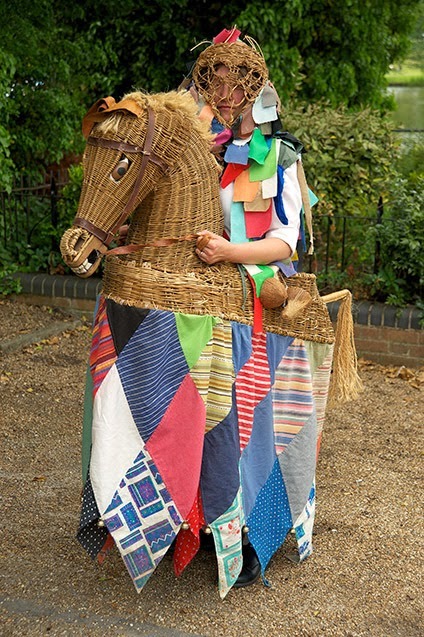 A short time later in 2005, I was given a wicker basket horse head without asking for one. That year Dobbin was created using a heavy metal ring for a body which resulted in being a bad choice for a hobby horse. 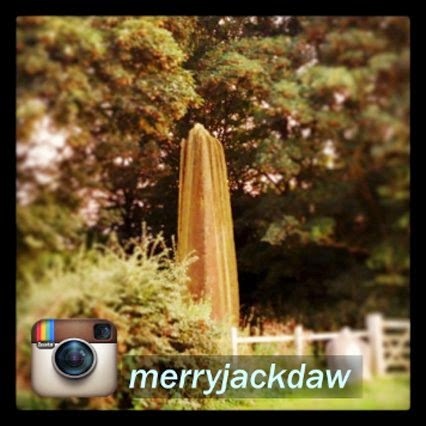 To read a detailed account of creating Dobbin in the early days, visit this very blog on this page here. 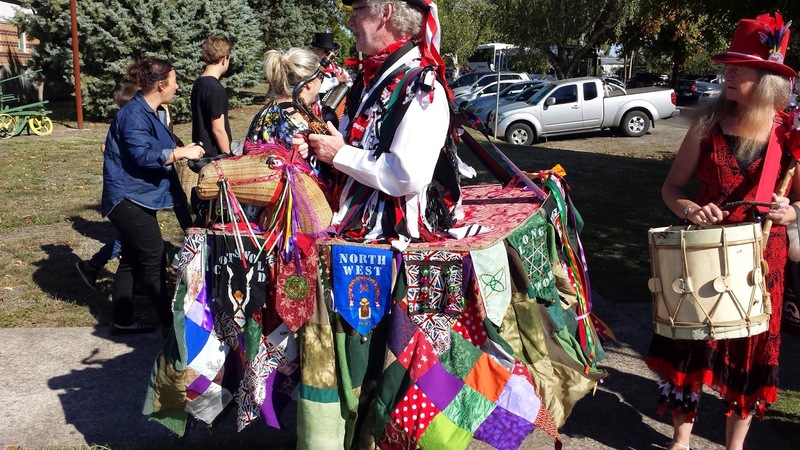 Dobbin is what you’d call a Tourney Hobby Horse, although Dobbin has no fake legs, nor does the rider. 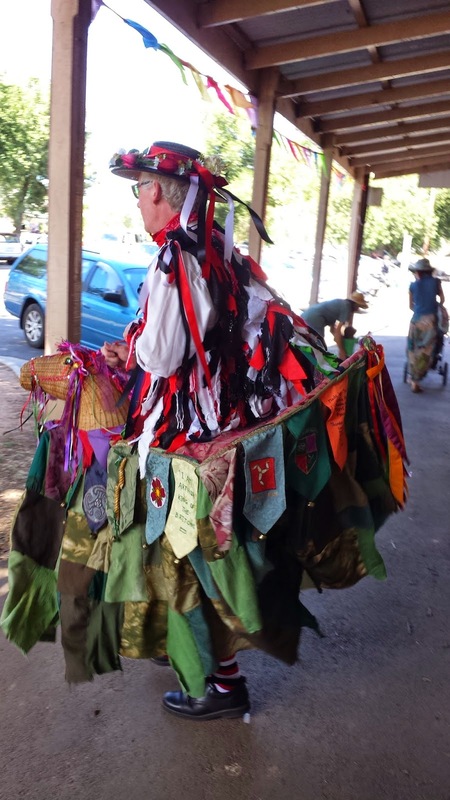 His body sits at waist length and he has straps to hold up the rider, (these days that is usually my fellow morris dancing friend Martin). 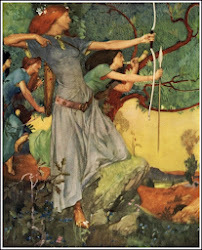 Some similarities come from the Wicker Man film. 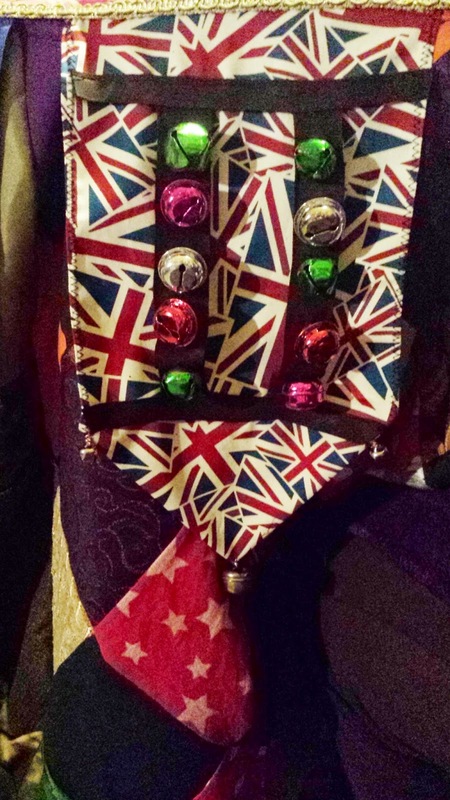 With the help of friends, I used scrap material to create a skirt and some flags with bells, very much like the one used in the Wicker Man film. My wicker basket horse head’s mouth could not move. I’ve not been bothered about that, but often get comments from people about how it should snap open and shut. I’d have to destroy the wicker head a little to achieve that. 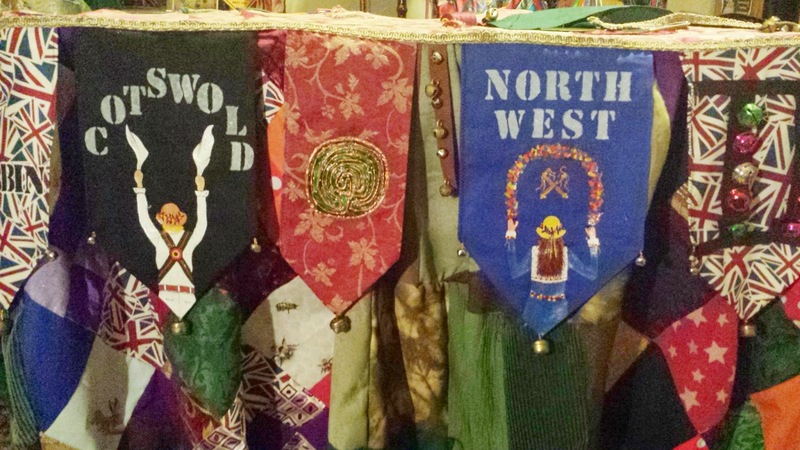 I focused on decorating the head and bridle, and getting friends to contribute to the hobby horse, by painting some sort of pagan-style design onto the flags I cut to shape. Version 1.0 of Dobbin lasted only one festival. 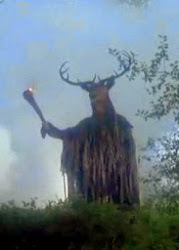 He was used in a 2005 Beltane ritual (late October for Australia) and afterward, the metal ring was discarded due to it being too heavy and hard to handle. My blacksmith friend made the ring for me, and I feel bad that it was not good to use. As far as I knew, the ring was abandoned at our friends house – not sure what happened to it after that. 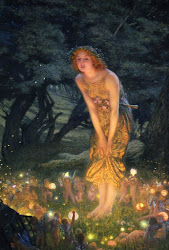 Even the pictures of that Beltane ritual were too blurry to show here on this blog post. After living in the UK for a few months (April – August 2006), I returned with new ideas for Dobbin. A lighter bamboo frame was designed and made by a friend – it was fish-shaped, and I simply re-gathered the skirt to fit, abandoned some of the flags (because this horse was smaller) and made some better straps for him. This version of Dobbin lasted until 2015. Gradually becoming a bit battered and faded, losing a few bells, some mirror squares off his red bridle, his gilded eyelids getting a bit tarnished, and his bamboo frame beginning to weaken at the joints, Dobbin only really went to the same Beltane festival once a year – other than that, he sat at home in an old mattress bag, or leaning against a wall in a storage shed. In dire need of a ‘make-over’, Dobbin began to suddenly get out more. In the last 9 years that this version of Dobbin has existed, I lived in England for 10 and a half months. While over there, as some of you know, I was a member of a Morris side and attended over a dozen folk festivals in the 9 months that I was in the side. 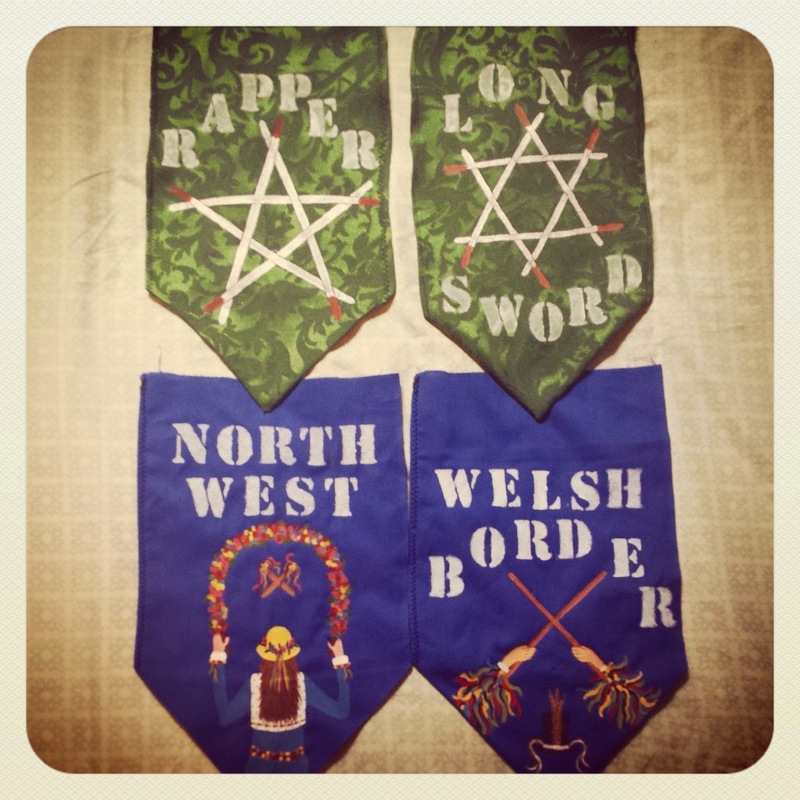 On my return (Sept 2012), I, naturally, joined a morris side here, something I’d been meaning to do for years, but did not until I’d been in one somewhere else in the world. 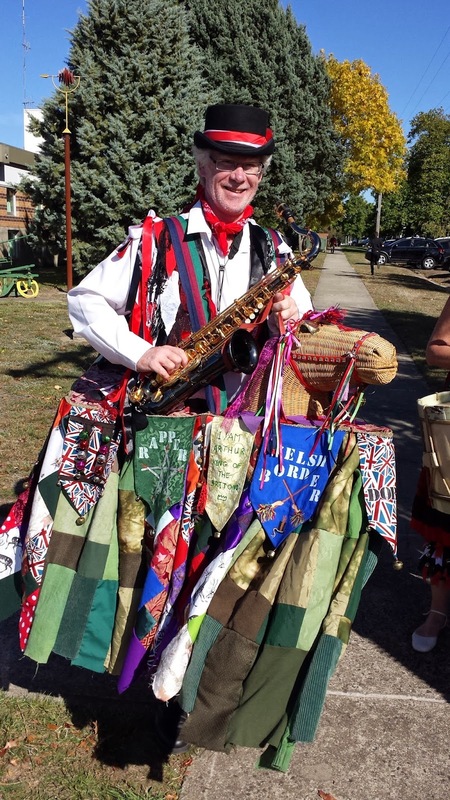 Now that I am attending folk festivals and morris dance-outs, Dobbin gets brought to events, once I’d told the morris side I was in that I had a hobby horse – not something a 30-something girl would usually admit to owning. I was even more eager to fix Dobbin up now, as his frame needed seeing to and other things mended. He was also becoming a bit dated for me. Some of the flags I had made had no meaning for me anymore and I chose to do something else for him, make him more folk dancing related rather than pagan-esque. 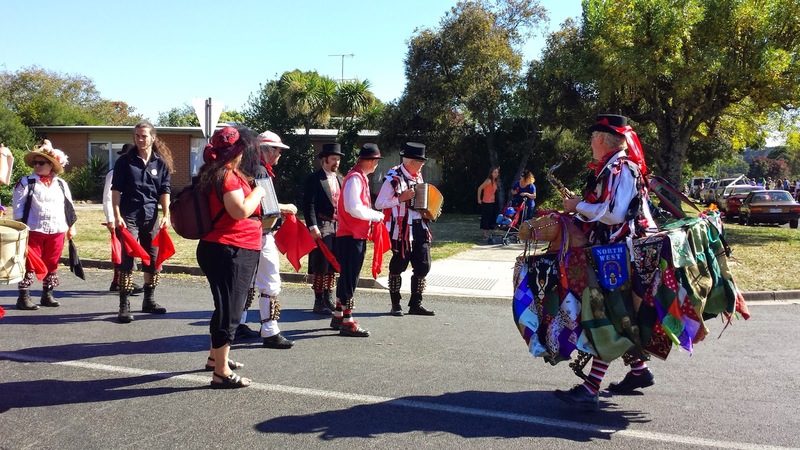 Then Dobbin got invited to the 2015 National Folk Festival in Canberra on Easter weekend. Time to get him fixed up – this gives me a time limit. Initially I was calling this new Dobbin Version 3.0 but he isn’t really – nothing on him has changed except adding more colour to his skirt, and making new flags for him – his frame is the same. I sat down one night a few weeks ago and pulled him apart, bits of glue and leather and wire falling off his frame, I looked with disgust at the way I had secured his frame – it was not greatly done, but I knew what to do this time (being an artist and crafty person, you grow with knowledge). Cable Ties! The magical wonder of Cable Ties! And duct tape! Huzzah! I was told that I had to make Dobbin ready for the weekend of 22nd March, so two weeks before then, I pulled him apart and made plans to get him prettier. I’d cut some squares from all my scrap material ages ago, to make patchwork cushions, but decided to use them for Dobbin instead. Sewing like a Trojan for a few days, I made a few sections of diamond-shaped patchwork and added it to the green patchwork skirt. I fixed the frame with cable ties (win!) and lots of duct tape, and the frame was wonderfully straight and secure now. 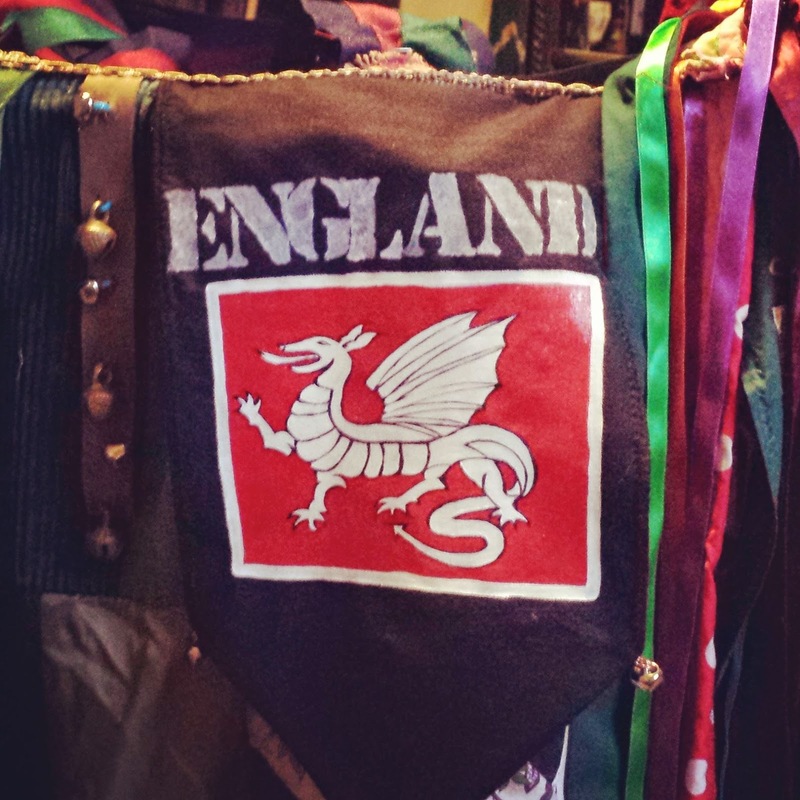 And I painted a White Dragon English flag too, replacing a St George flag. Screw St George, I’d rather the Dragon. I had to get Dobbin finished on Friday the 20th March, since I was working all weekend and going out for dinner on the Saturday, so Friday was my last chance before handing him over at 10.30am on Sunday the 22nd at the Ballan Autumn Festival in time for the parade. I succeeded in getting him done – all put together, hand sewn and back to normal – this time, a bit prettier. Also he was covered with more bells than before. 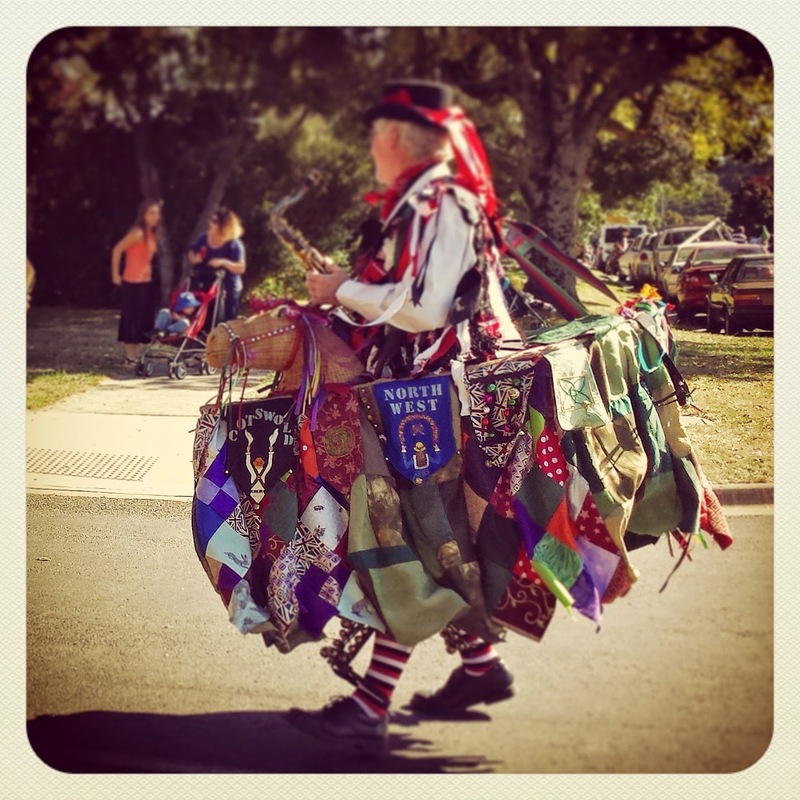 Dobbin jingled away down the streets of Ballan when I passed him over to Martin and Marie, and later they took him home to fix his straps to suit their needs for the National Folk Festival two weeks later. This folkie has just finished now, although I did not see any images of him online, I am hoping Dobbin had a great weekend in Canberra (he should have – he got invited but I didn’t!) I was told that Dobbin might ride a unicycle. I requested video footage if that were ever to happen! What would be awesome is if Dobbin and I could tour the UK. 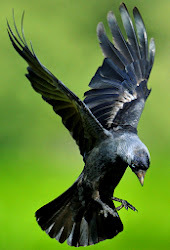 I’d take him to Banbury Hobby Horse Festival and other folkie events with my Morris side the Thieving Magpies.